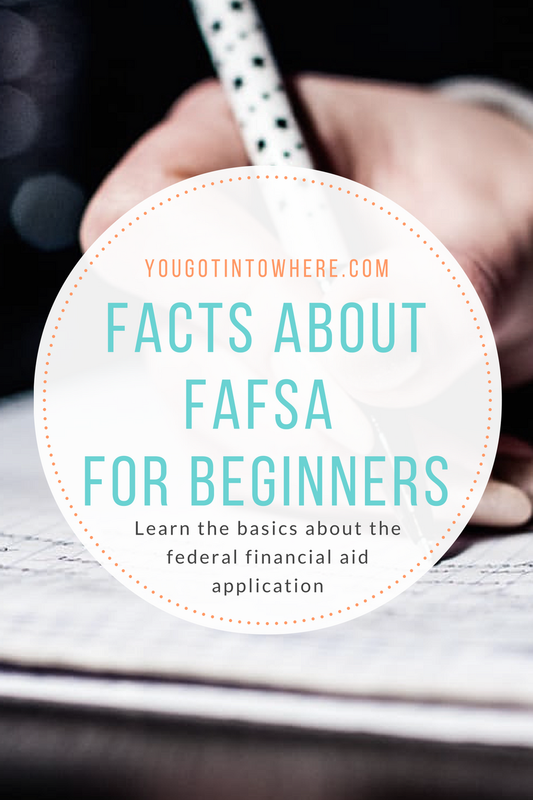 Facts About the FAFSA Application Process for Beginners — You Got Into Where? What is the FAFSA and How Do I Fill It Out? The FAFSA stands for Free Application for Federal Student Aid. The FAFSA is the form required at all colleges that accept and award financial aid. It’s the form that provides your college financial aid officers with the information they need to go ahead and create your financial aid package. The form helps determine the awarding of over $150 billion in federal aid, as well as state aid. To complete the FAFSA you’ll need to provide information from, in this case, your parents' most recent tax return, W-2’s and bank statements. (If your parents are divorced or separated, it’s based on the parent you spent the most time within the previous year). You must file a new FAFSA each academic year you want aid. Every state has its own deadline for the FAFSA. Some states and colleges distribute aid on a first come, first-serve basis, so file as soon as you can. High school seniors should fill out a 2017-18 FAFSA as soon as possible. Wherever you live, you should check with your college guidance counselor to find out your college choices deadline for the FAFSA. The FAFSA gives you a full 18 months to file, so don’t worry if you’re late. This means that students who started college in the fall of 2016 can still file the FAFSA as late as June 30, 2017, and receive federal grants or loans. Who is Eligible to apply for the FAFSA? Everyone is encouraged to apply. Low-income students who fill out the FAFSA typically receive full tuition from colleges if they come from disadvantaged backgrounds. Students, who do come from a low-income are still encouraged to apply; In some cases, the student’s family may be asked to pay a portion of the tuition if not full. However, students who are undocumented are not eligible for federal student aid. If the parents aren’t documented but the student is, you can still apply. Now you know the important facts of the FAFSA. You know what the FAFSA stands for, when it’s due and who’s eligible to apply. Though all of this information may seem intimidating, don’t shy away from it. You never know what will happen.